We’d love your help. Let us know what’s wrong with this preview of Return of the Crown by Millie Burns. To ask other readers questions about Return of the Crown, please sign up. I bumped the rating up because I enjoyed the last 50 pages. I will be talking more about this book in my January wrap up. From the moment the ship leaves port I knew I was in for a ride with many twists and turns. In Return of the Crown, the traditional style of storytelling runs the gamut of fantasy related imagery without feeling out of date, or overwrought with detail. There are lots of interesting creatures that Rayvn befriends as she makes her ascent (or descent) to battle the evil Zelera. The landscape of Ravyn's and Blade's trek involves a labyrinth of obstacles, each with its own unique character and degree From the moment the ship leaves port I knew I was in for a ride with many twists and turns. In Return of the Crown, the traditional style of storytelling runs the gamut of fantasy related imagery without feeling out of date, or overwrought with detail. There are lots of interesting creatures that Rayvn befriends as she makes her ascent (or descent) to battle the evil Zelera. The landscape of Ravyn's and Blade's trek involves a labyrinth of obstacles, each with its own unique character and degree of difficulty (such as scaling down a sheer rock cliff face with thugs in pursuit), that evolve into toughest one of all. Burns deft storytelling and crafty dialogue make this book a treat to look forward to whether you're a speed reader or snail-paced muller like myself. Another thing I found interesting is that this book doesn't employ a lot of gratuitous violence which I found to be unusual for this genre, but in this case, it works. There is a clear line of good and evil so it won't be stretch for a young reader to understand the dynamics among the characters. Return of the Crown has a likable (and unlikable) cast of main characters: Rayvn is a heroine that has a knack for making friends. Conner is like the witty old uncle you wished you've always had. Zelera is downright scary although I did get a chuckle out of her propensity for losing her cool. I won this book as part of a Goodreads Firstreads giveaway. There's magic (both dark and light), dragons, elves, talking wolves and all kinds of dark creatures in this wonderful fantasy journey. The storyline follows the coming of age of a teenager as she discovers her magical powers and that only she can save her kingdom from the dark foreces. The story moves well and keeps the reader engaged. It definitely sets itself for a sequel (which I would love to read if and when it comes out). Overall a I won this book as part of a Goodreads Firstreads giveaway. The Return of the Crown was an enjoyable read that took me back to my childhood in many ways. This is written for younger audiences, I assume, just by the tone and content in the story. It is fast-paced, and definitely never boring! You've got elves and sharks, unicorns, and harpies, and all kinds of magical creatures in this storyline. It follows a young girl, a Princess named Ravyn, as she goes on a quest to reclaim her kingdom, save her parents, and overthrow her tyrannical aunt Zelera. Admi The Return of the Crown was an enjoyable read that took me back to my childhood in many ways. This is written for younger audiences, I assume, just by the tone and content in the story. It is fast-paced, and definitely never boring! You've got elves and sharks, unicorns, and harpies, and all kinds of magical creatures in this storyline. It follows a young girl, a Princess named Ravyn, as she goes on a quest to reclaim her kingdom, save her parents, and overthrow her tyrannical aunt Zelera. Admittedly, I was a little put off by the writing style at first. It's probably because I'm not used to reading things meant for younger audiences, but the fact that Zelera cackles and literally muses her hands, and then shrieks in anger at the top of a battlement was a little pungently adolescent for me. What's funny is that I knew from the get-go this author has a fantastic vocabulary. I felt like taking notes on some of these words she used. Lots of variety! The downside to that is the author might have used just a bit too many adjectives and adverbs for the characters. It reminded me of teenage boys who wear too much Axe deodorant. A little goes a long way! And on the topic of descriptions, some of them were, I think, unintentionally funny. Like the fact that evil Zelera's essence reeked of sulfur whenever she used her magic. Like...a fart? It made me giggle. But as I went along, I got used to the somewhat outrageous and dramatic style of the story, and I settled in and was able to gobble it up in one evening. Zelera started to make an impression on me--there was just something hilarious about how overly dramatic she was all the time. She threw things at walls and tortured servants just because. And the best part, seriously made me laugh out loud sometimes, was the fact that she had trapped the former king and queen in a mirror, and she kind of monologued at them most of the time. It was delightfully loony. Part of the reason this score is a 6 and not a 7 is because I found some grammatical errors. Also, she head-hopped. Head hopping is a big no-no for me! It's something that we authors all have to learn to control, and in this case, there was just too much of it. She went from one character to another without any real organization or form, and it made it difficult to follow. (I find THIS ARTICLE to be a good description of what head-hopping is and why not to do it.) I was not a fan of the cliches and modern word usage, either. Phrases like, "more than one way to skin a cat," along with words like, "adrenaline," and "rappel," just don't fit very well in Fantasy books. That said, I found that along with Ms. Burns' excellent vocabulary, she had some truly lovely descriptions sprinkled into this work. For example, as two characters wait by the sea before the MC must leave her friend behind, Burns described it so: "The waves rolled in and out, taking time with them." I re-read that a few times because I liked it so much. SO, in conclusion, I think this was a fun, quickly-paced book that is appropriate and indeed, FUN for young audiences. I felt it lacked a certain depth and nuance (again, lots of overly dramatic character actions and descriptions), and that could just be attributed to personal taste. But I would DEFINITELY recommend it to the younger set, and it would be a lively, engaging novel for parents and their children to read out loud to one another. This could very well inspire little dreamers to read more and delve deeper into the literary world. Young Ravyn faces the loss of everything she knows when her aunt, practitioner of dark magic tries to wipe out everyone who stands between herself and the throne. The young girl is dumped on an island with no idea what has happened to her parents. She would have grown up alone if not for the elf Rowan who tended the island. Rowan ensured that Ravyn grew up to be an intelligent and resourceful teenager, but even he knew her time to leave was approaching. On her sixteenth birthday, Ravyn discovers her control over light magic and reconnects with her father's former adviser, Connor. Connor instructs her to stop using her magic to avoid the wrath of her aunt, and to build a raft so that she can return home and begin her quest to regain the throne. Along the way, Ravyn faces many trials as her aunt attempts to prevent her return. The book reminded me of the old tales of quests found in various mythologies. At every small quest Ravyn faces, she gains a skill or item needed to complete the larger quest. She grows as a person, becoming stronger and wiser in preparation to face her aunt and return light to her realm. She receives aid from Connor, who helps her to understand her magic, and her childhood friend Blade, who becomes her traveling companion and protector. Millie Burns provides a fast paced journey into a fantasy world with nearly every type of creature you could wish to find; elves, unicorns, dragons. . . The reader never knows what Ravyn may face next. Although, some of the obstacles were overcome too easily. Ravyn talks her way out of most situations, or is generally saved by a combination of good graces and magic. There were also technical issues that bugged me while reading. The POV wasn't always as clear as I would have liked, and there was a bit of head hopping. There were also a few spots where adjectives and wordy descriptions could have been trimmed out to make the text more succinct. However, the engaging story and strong characters made up for these shortcomings. My verdict--I enjoyed the time I spent submerged in this book, and if you'd like a fantasy reminiscent of old epic quests, you should give this one a try. Upon her sixteenth birthday, when her natural talents in the light arts appear, the fun and the quest begins. Finding her way back will be more difficult than she anticipated. 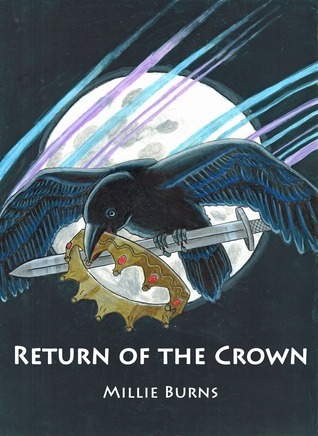 With the help of old friends, and new enchanted friends, she faces new challenges, learning that magic is no "Return of the Crown" is a return of the fantasy fun. When the evil plans of a sorceress imprison the king & queen, and bring evil to the land, Princess Rayven must find a way to free her family and her kingdom. I loved this book and had a difficult time putting it down. It has everything elves to wolves, unicorns to dolphins, and much more. Millie Burns takes a unique look at magic and magical creatures. I also loved that this book showed the power of compassion. Which may not be a magic power, but its results are just as powerful as a magicians. I enjoyed her book immensely and truly hope that there will be a second book. This book is a well-written and entertaining adventure from page one until the last page. A fantasy tale, Burns relies on an old school, borderline fairytale premise, to create this story, which makes it wonderful for middle-graders. Infused with dragons, magic, and even a wicked aunt who steals the crown, it is a story of good vs evil. The writing is full of action, provides good imagery, but never gets bogged down in descriptive tedium.